BOSTON, MA, UNITED STATES, October 23, 2018 /EINPresswire.com/ -- Compass Furnished Apartments, a premier provider of fully furnished apartments throughout the Northeast, announced today that the company was awarded the 2018 Platinum Commitment to Excellence Award from Cartus Corporation. The annual award is presented to relocation service providers for excellence in service delivered throughout the past year. “With Cartus, it really is all about service and the transferee’s experience. Our team’s commitment to exceeding guest expectations and providing exemplary service from before booking to after move-out are evident in the receipt of this award. It’s an honor to work with such a dedicated team and be recognized by Cartus on the platinum level,” said Nicole Fensore-Brady, Reservations Specialist. The Platinum award marks the highest level of achievement for service, recognizing Cartus Global Network members who obtain 95% or higher overall satisfaction levels in the area of service. These results are gathered directly from guest surveys received by Cartus following stays with a corporate housing provider. Suppliers achieving Platinum level recognition for their performance in 2018 had to perform across a number of business disciplines to receive this designation. Compass is honored to have been recognized multiple times. This award marks the fourth time Compass has achieved such status, and the seventh overall time being recognized by Cartus. The award was received at the 18th annual Cartus Global Network Awards held in Seattle, Washington on October 15-16, 2018. Approximately 360 attendees from 170 companies and 39 different countries attended the conference. The conference, whose theme centered on "Move Ahead", recognizes the extraordinary achievements of network members in serving Cartus' clients and customers worldwide. For over 60 years, Cartus, a global relocation company, has provided guidance to organizations helping relocate employees and their families while providing a full spectrum of services to their clients. Cartus serves more than half of the Fortune 500 and has moved employees into and out of 185 countries. 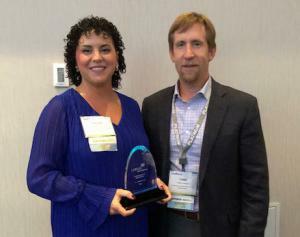 Cartus hosted their 17th Annual Global Network Conference in Chicago, IL, September 25-26th in which they celebrated their service chain partner’s extraordinary service in 2017. Please visit, www.cartus.com, for more information. Compass Furnished Apartments is a leading provider of both short-term and long-term fully furnished apartments throughout the Northeastern United States. Our comfortable homes, streamlined reservation process, and “concierge-style” client services enable us to provide our guests with an exceptional experience, all at a tremendous value. Our forward-looking approach to technology and sustainable business practices - coupled with our experience in evaluating and fulfilling the specific needs of every client – lead many to choose Compass for their furnished apartment needs. For more information, visit www.compasscorp.com or follow us on social media @compassfurnapts.